The handles of the Seki Magoroku Kinju and Hekiju series differ in shape and material. The hexagonal handle of the Kinju knives is made of laminated, reinforced wood for a comfortable feel when cutting. The handle is extremely water-resistant, thanks to the use of high-quality natural wood which is treated by a special process. The handle of the Hekiju knife, developed for left-handers, is more rounded than that of the Kinju series and consists of a robust resin with leather-type embossing. Unique technologies are applied in producing the knives in the Seki Magoroku Kinju and Hekiju series, making it possible to create the premium-quality, pointed cutting edges of traditional blades. Maximum blade sharpness is achieved by the highly precise processing of the cutting edge. The Seki Magoroku Kinju and Hekiju kitchen knives make a strong impression with their high levels of functionality and durability. They lie particularly lightly in the hand and, with their blades ground on one side, enable extremely precise cuts. The 7 blades of the Kinju knives are suitable for right-handers, while the two blades of the Hekiju series are specially designed for left-handed users. 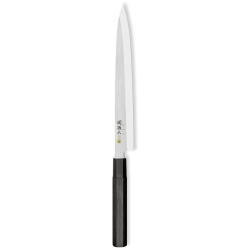 The Kinju series includes four different lengths of the sturdy Deba blade and three lengths of the Yanagiba, a ﬁlleting knife for raw ﬁsh and meat. The Hekiju series includes a Deba and a Yanagiba. The chef's knives of the new Seki Magoroku Kinju and Hekiju series feature traditional Japanese blade shapes and help users (for the ﬁrst time also left-handers) to beneﬁt from the advantages and cutting techniques of knives sharpened on one side.